2. The different methods that were used to apply the tagging to the stamps. 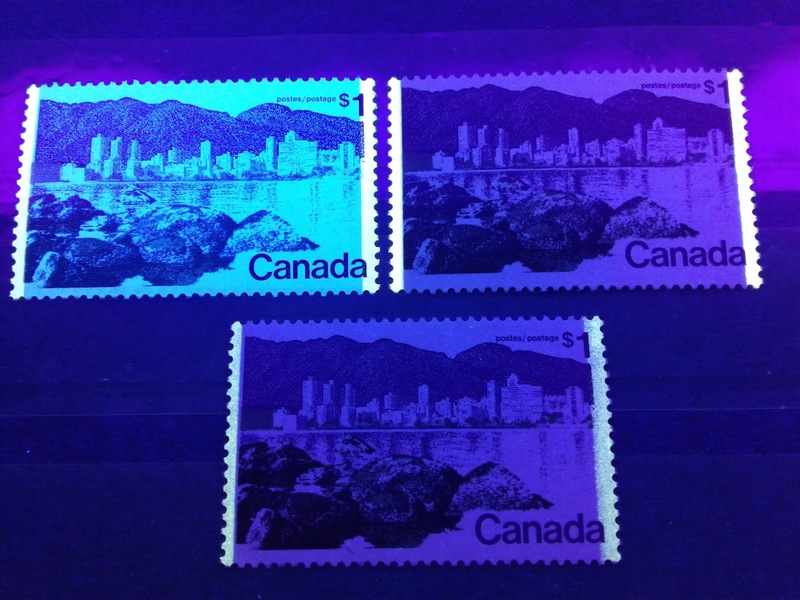 In the case of the low value stamps printed by Canadian Bank Note Company, there are notable differences in the appearance of the tagging on the stamps. Some stamps have tagging that is very light, being barely visible under normal lighting conditions, while others have moderate tagging that is clearly visible. Some stamps also have very dark tagging that is deep yellow in colour. The stamp on the left, shows the light tagging, while the moderate tagging is shown in the middle, and the dark tagging is shown on the right. What is interesting is that the dark tagging only seems to occur on the very late printings made after December 1976. Thus, these differences do appear to have philatelic significance, rather than just being random. The method of application of the tagging seems to have differed for the various printings also. This concept is not new, as those familiar with the Great Britain stamps for the 1960's will no doubt have had some exposure to this already. For that country many of the phosphors can be found applied either by typography or flexography. 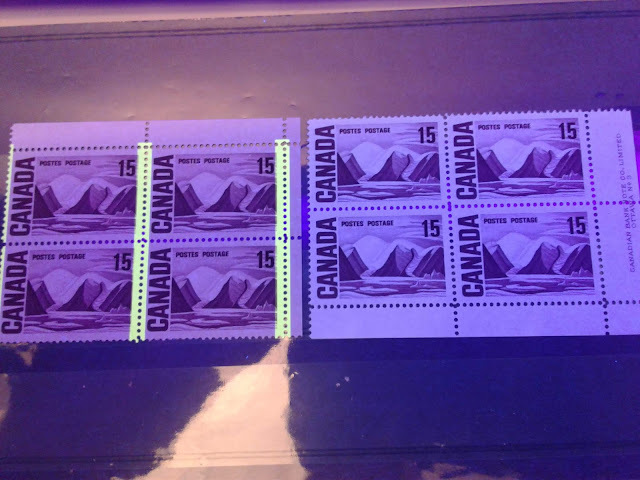 The low value stamps printed by CBN always have tagging that appears completely solid under UV light, and it would appear that this was applied by flexography. However, for the stamps printed by the BABN, the earliest printings show a distinct "screened" appearance to the tagging, in which a dotted pattern is clearly visible within the tagging. Later, this gives way to far more solid appearing tagging, which appears deeper and brighter yellow under UV. Finally, the last printings of the perf. 12.5 x 12 and all the printings perf. 13.3 show clearly mottled tagging that appears to have been applied by rubber cylinder. In addition to the different appearance of the tagging under UV, the different forms of tagging also appear different under normal light. The mottled tagging always can be seen on the stamps as thick, glossy bands that run down the sides of the stamp. In contrast, the other forms of tagging appear quite dull and, with the exception of the Winnipeg tagging, are barely visible on the stamps at all. In this picture, the bottom stamp is one of the original 1973 printings showing the screened tagging. The upper left stamp is the mottled tagging on a late printing made on hibrite paper, while the upper right stamp is a more solid, but not mottled tag, from one of the mid-range printings made between late 1973 and 1975.